Hello! Sadly I don't have an outfit post this week, I've got something really important on at work that I've had to prepare for, and just haven't had time to get much else done. I'll maybe post a late one during the week if I have time! Recently I've had my eye on these printed jeans from Motel Rocks, so thought I'd do a quick post on how I'd (like to) style them. I love A/W florals and think the mustard pompom hat goes really well and brings out the colours in the pattern. I'd keep the top half quite simple and picked this gorgeous white jumper from Topshop - it's a bit pricey though so I'll have to look out for that one in the sales! It's bad enough that I'm excited about Christmas already, but it's even worse that I'm excited for the Boxing Day sales! Oh how I love this time of year! How would you style printed trousers for A/W? 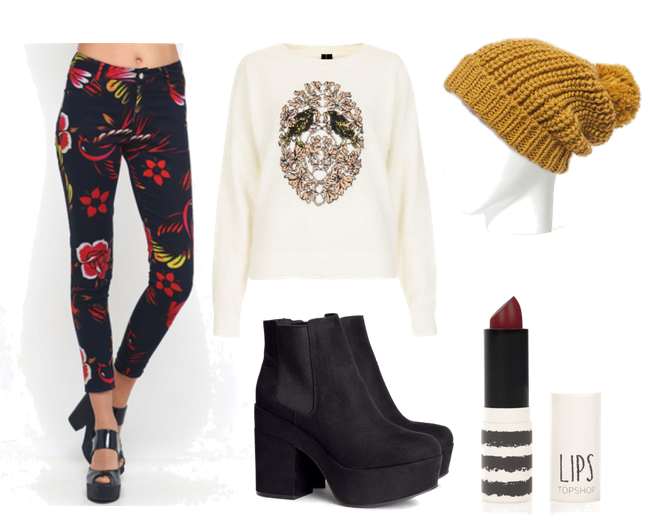 11 comments on "How I'd Style Printed Trousers"
I love the look of the jumper & topshop lipstick - great post. Loving that deep cherry Topshop lipstick! great styling :) lovely blog! Lovely! I especially like those boots.